Another warm twilight evening, another chance to paint some Descanso Oaks. I picked a different view this week and did a little rearranging of the shrubberies to create a path where there was none. You can see the work in progress below. As should be evident from the photo, which my husband took for me, the leftmost trunk is very straight in reality and I painted it that way. When I got home and put the panel in a frame, I didn’t like the effect at all … it was a like an arrow shooting right out of the frame. So I repainted the trunk to give it some bends and curves and had to use my imagination to think through how the light would wrap around the bends. I also lifted the San Gabriel Mountain range to make it peek through the distant foliage, and created a variety of patterns in the foreground which was just shredded wood bark in full shade, very drab. 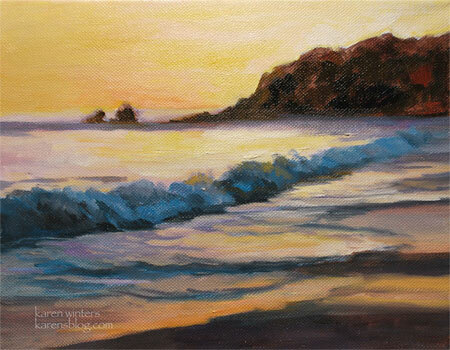 So even though the colors of the actual scene were rather subdued there was salsa music playing and I painted an emotional response to the scene, not a literal rendering. For more information and pricing, please write. Although this painting is sold, I have others. 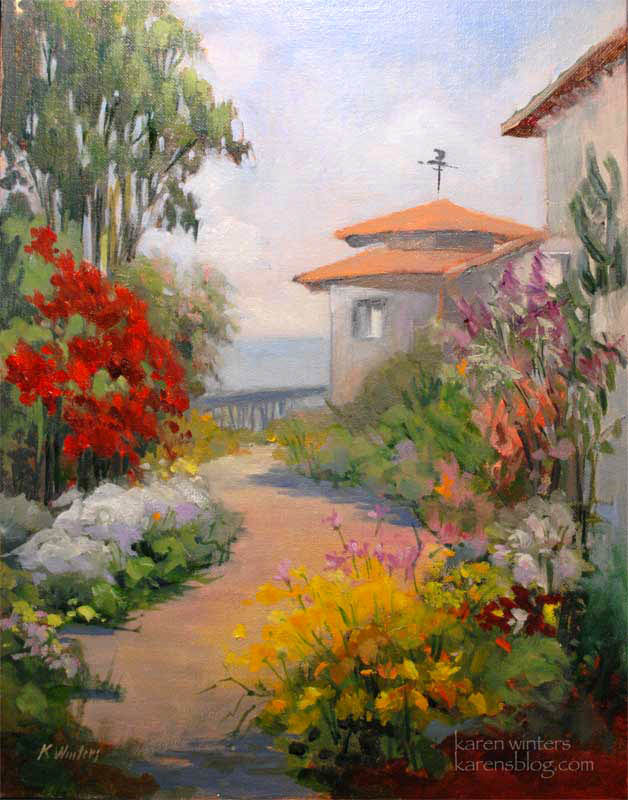 I have been meaning to post this painting which I painted at Casa Romantica, a beautiful old Spanish building which is now used for weddings and meetings. 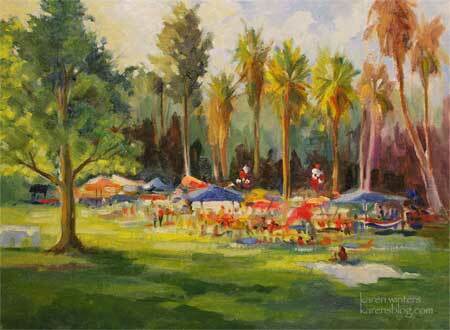 This was painted on Thursday of the San Clemente paint out, in late June. This particular part of the garden is called The Butterfly Garden. Host plants like buddleia, milkweed, cosmos and many others are planted to attract the insects. A trellis is placed on the wall to the right where the caterpillars attach themselves and create their chrysalises (chrysales?) If you look at these precious ornaments very closely you can see the monarch wings in various states of metamorphosis. Among the flowers, I have suggested a number of butterflies in the garden. Can you find them all? In the distance is the San Clemente pier, a local landmark. 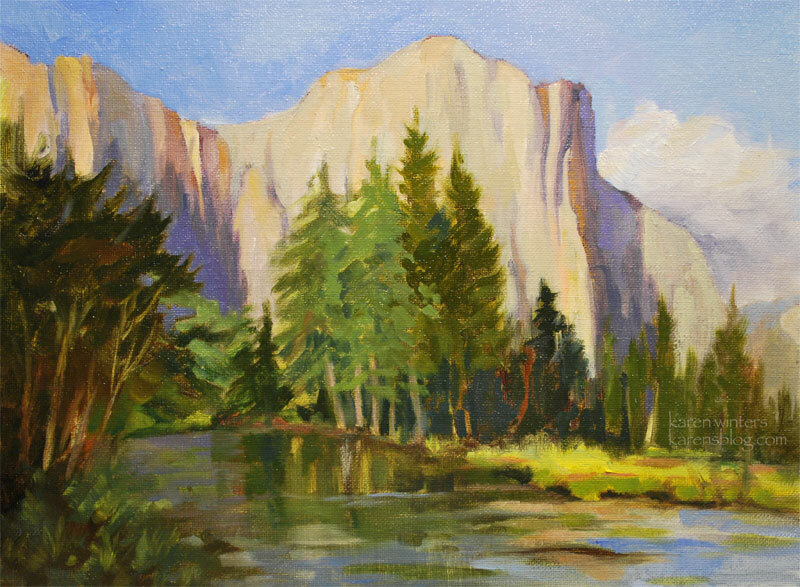 By the time I finished this, in the afternoon, the June gloom morning fog had burned off. 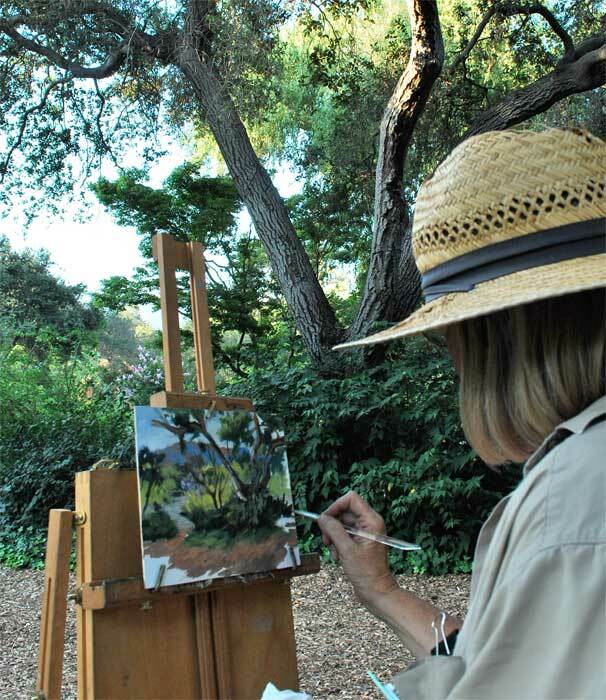 Laguna is one of my favorite painting locations and when the sun gets really low, it’s magical. Interested in this painting? Please write. This was painted en plein air Friday, July 17 in Yosemite Valley. Well, I’m back from our whirlwind tour of Northern California. I didn’t have the time or energy to upload paintings every day, but now that I’m back I’m going to try to catch up. This was painted on the last day of our trip, late in the afternoon. 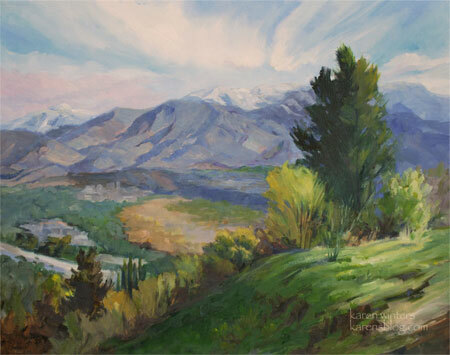 If you are a new visitor to my blog, one of the people who saw me painting this in progress, welcome! Now you know how it turned out. 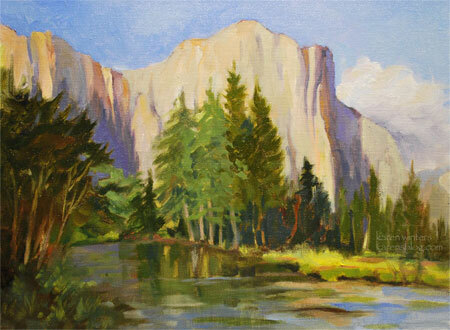 Yosemite Valley was spectacular, as always, but it was very hot, as it currently is in Los Angeles. But just looking at the cool water of the Merced River seemed to help. Those distant thunderheads, which rose as I painted, tell you how much moisture and humidity there was in the air. As always, people gathered around to watch me tackle the scene. They are always very polite and ask if they can watch. I let them know that if I wanted to be alone, I’d be in my studio! I truly enjoy having observers, as long as they are ok with me continuing to work as we chat. My husband took the picture below as I wrapped up. You can see by the painting compared to the final photo how much the light changed during the time I was painting. But it’s a no-win game to keep chasing shadows. You just have to draw them in at the beginning and then stick with the plan. Interested in a painting of your event? Please write. Upon returning home from our Northern California trip, I had the opportunity to paint Saturday night at the Pasadena Pops at Descanso Gardens. 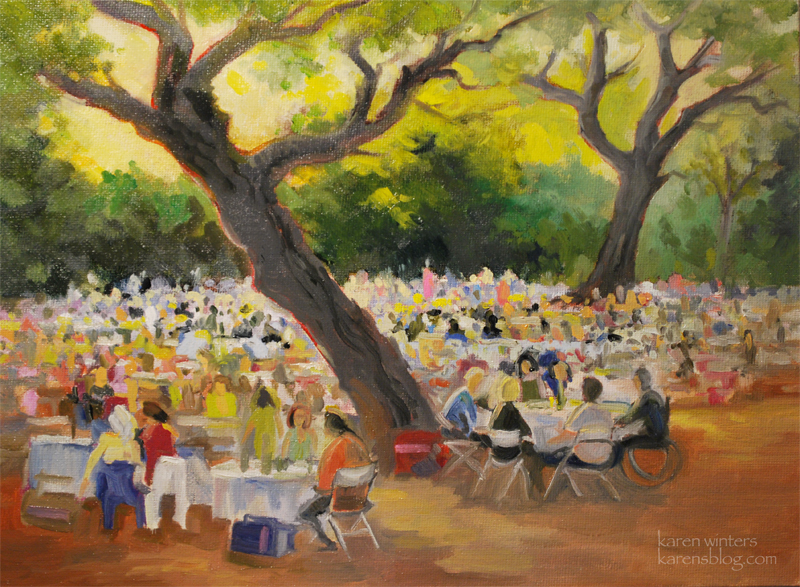 The big oaks were just glowing in the late afternoon sun so I decided to paint the festivities from this angle instead of looking toward the stage. The orchestra, conducted by Maestra Rachel Worby, was divine, as usual. Some highlights for me were the Edith Piaf tribute, Offenbach’s Can-Can (complete with saucy dancers) and the concluding Gershwin number, An American in Paris. Yes, it was an evening in Paris theme. 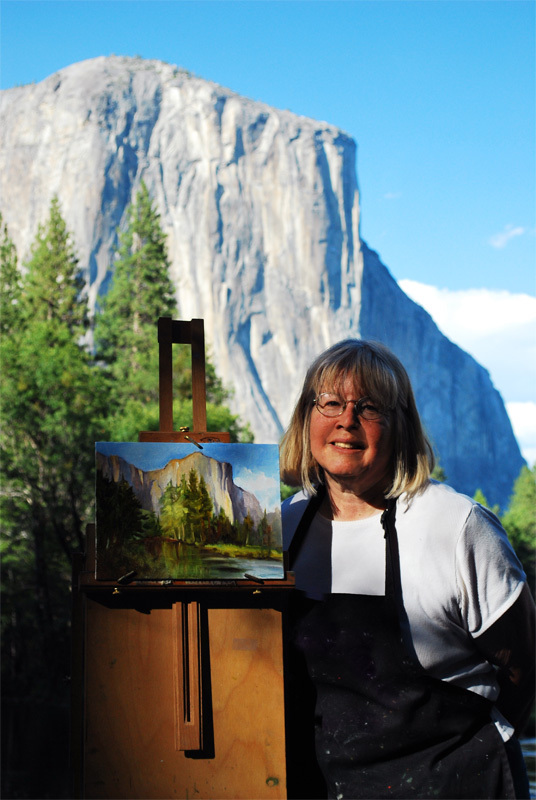 As a plein air impressionist I felt right at home. This painting was challenging not only because I was quite tired from the weeklong painting adventure up north, but because of the heat and the rapid light changes. I got most of it blocked in during the show but needed to retreat to my studio to pull it together and add the finishing touches. We’ve been having a great time seeing some of the natural beauty of Northern California, and this is one of my recent studies from a few days ago at Point Lobos. I’m updating from the road so I don’t have quite as much time for blogging – there’s too much to see and do. This scene is from Pt. Lobos State Park, on the Monterey Peninsula. It’s a breathtaking place and I could spend days there. We’ve also spent some time in Big Sur, San Francisco and around Paso Robles and the central coast. I don’t have Photoshop with me on this computer so I can’t tweak the colors to get them exactly like the original, which is a bit frustrating. IPhoto does an ok job, but it doesn’t have the control I’m used to with PS. Last night we went to see Wicked, a Christmas present from our kids. It was fantastic and I recommend it to anyone who hasn’t seen it yet. A great musical and one that will surely become a classic in American musical theater. 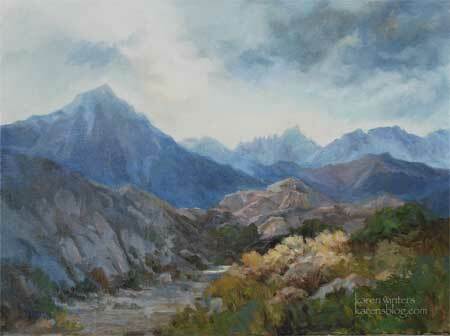 Some time this fall we’re going to return to the area again for another painting and research trip. 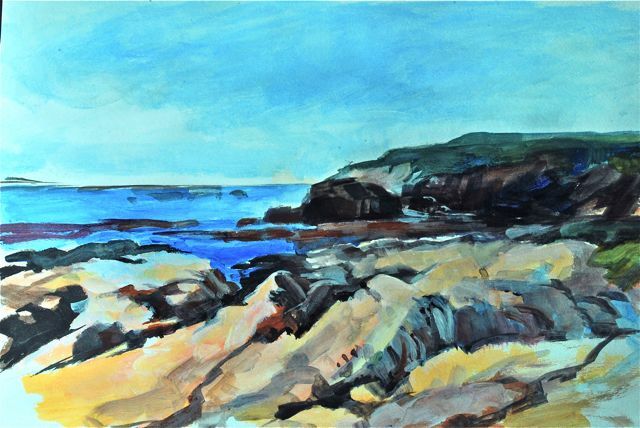 A new collector has tipped me off to some beautiful painting spots in the area – and it’s a trip I’m eagerly anticipating. Click the image for a higher quality, larger version. Well, this time it really was! My husband and I have gone to Lacy Park in San Marino through the years, but it’s never livelier than on the fourth when everyone turns out for picnicking and fireworks. There was so much color and excitement everywhere I hardly knew where to begin. Finally I settled on this familiar view of the palms surrounding the big lawn. By the time we left there was hardly a patch of green grass to be seen. For those people who stopped by to take a peek at my work in progress, here’s the finished version, soon to be signed and framed. 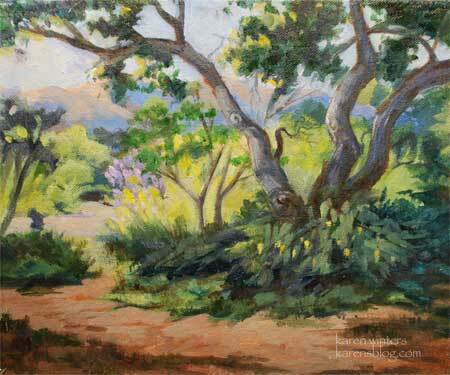 This is a view into the Crescenta Canada Valley from a high road in Flintridge, near the Sacred Heart Academy. The 210 freeway can be seen on the left as it passes the upper Arroyo Seco. The mountains are the San Gabriel range. Last winter, a snowstorm left a dusting of snow on the Angeles Crest Forest. It only lasted a few days but I had the opportunity to take some early morning pictures of this rare occurrence. By the next day, most of the snow had vanished. Now that the temperatures have reached the high 90s locally, I thought it was a good time to think about something cool. 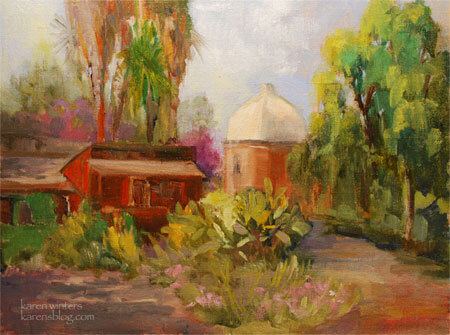 Among the other locations we explored during our week in San Clemente was nearby San Juan Capistrano. 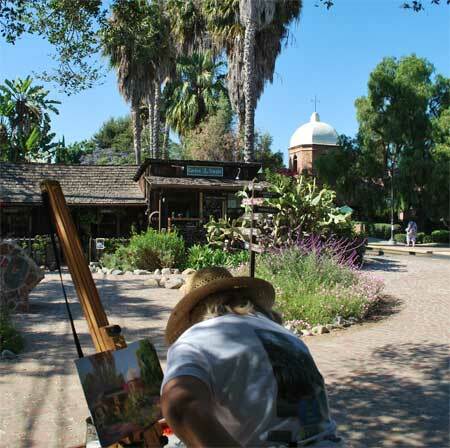 The old train station is a picturesque diversion bordering the Los Rios Historical District. I found a good spot in the shade and had fun talking to people as I painted.